Written for the Coursera (MOOC) Class ‘Climate Literacy: Navigating Climate Change Conversations‘ by the University of British Columbia (July 2013). Scotland is country of the United Kingdom, together with England, Wales and Northern Ireland. It lies on the northwest edge of Europe on the Atlantic Ocean and has a temperate climate. Primarily it is governed by the UK government in Westminster, London, and on devolved matters by the Scottish government in Holyrood, Edinburgh. Scotland has a stable population of 5.3 million and a land area of 78,387 km2. In line with the UNFCCC Kyoto Protocol and European Union targets to mitigate against climate change and global warming, Scotland is working with a set of ambitious targets to reduce CO2 emissions and help protect the environment. 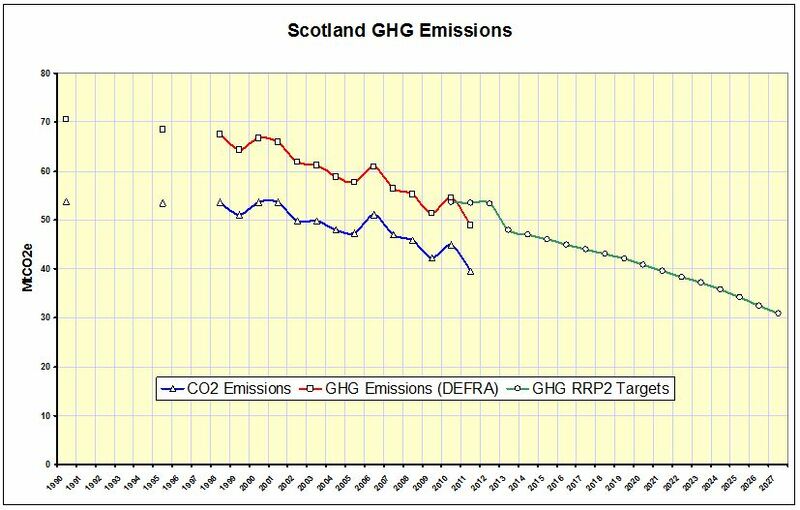 In the Climate Change (Scotland) Act of 2009 [1.0], targets are defined to reduce Scotland’s emissions of six Kyoto Protocol greenhouse gases by at least 42% by 2020 and 80% by 2050. Scotland’s share of emissions from international aviation and shipping are included in the targets [1.1]. Carbon dioxide gas, produced by burning fossil fuels such as oil, coal and natural gas, has accumulated in the earth’s atmosphere. It acts as a greenhouse gas, trapping infrared radiation from the earth’s surface and the atmosphere, causing global warming. Around one quarter of a tree’s live weight is carbon and one tree removes around one tonne of CO2 in its lifetime. Photosynthesis occurs in sufficient sunlight, where trees absorb (via leaves) and convert CO2 to soluble carbohydrate food, which provides energy for growth. Some of this is converted to new sapwood in the outer ring, immediately beneath the bark [2.0]. Conversion of the carbohydrate to energy (respiration) is a continuous process (24 hours per day), consuming a quantity of oxygen, releasing CO2 and water, using between 25% and 50% of carbohydrate produced during photosynthesis. Trees are therefore net absorbers of CO2. Carbon sequestration is the removal and storage of CO2 from the atmosphere, thus reducing the greenhouse effect. 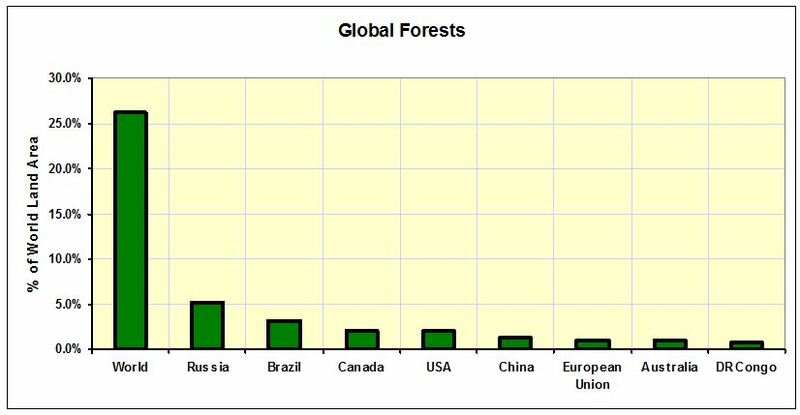 The IPCC recognize that global forests are large carbon stores and can affect the overall atmospheric CO2 balance. Trees are effective at removing CO2 from the atmosphere during photosynthesis and store carbon in new growth wood [2.1]. Decomposing and burning wood releases stored carbon back into the environment and recent widespread deforestation has added to atmospheric CO2 in significant quantities. Conversely, afforestation helps to remove atmospheric CO2 and is seen by the IPCC as an integral strategy in mitigating against global warming. Trees account for about half of all terrestrial stored carbon, absorbing 3 gigatonnes annually. However, deforestation releases carbon back to the atmosphere, and it is estimated that during the 1980s, this amounted to one quarter of anthropogenic CO2 emissions. Substitution of fossil fuels with biomass. As trees grow, they use a portion of the carbon absorbed from the atmosphere to build new layers and grow in length. 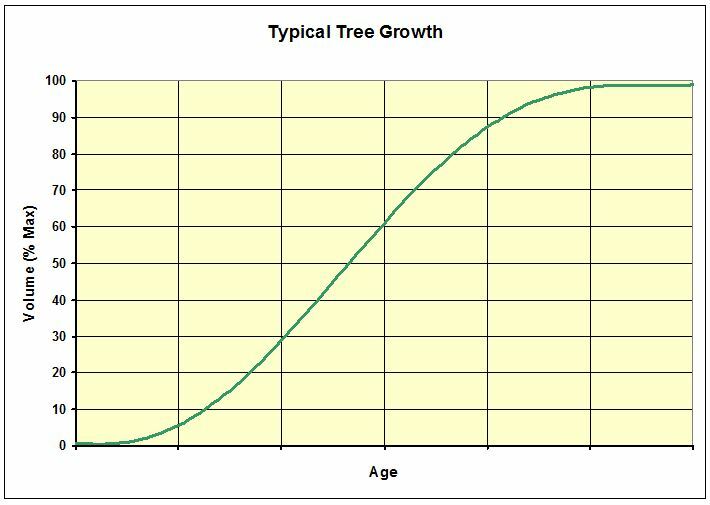 So the amount of carbon accumulated in woody mass is proportional to growth. 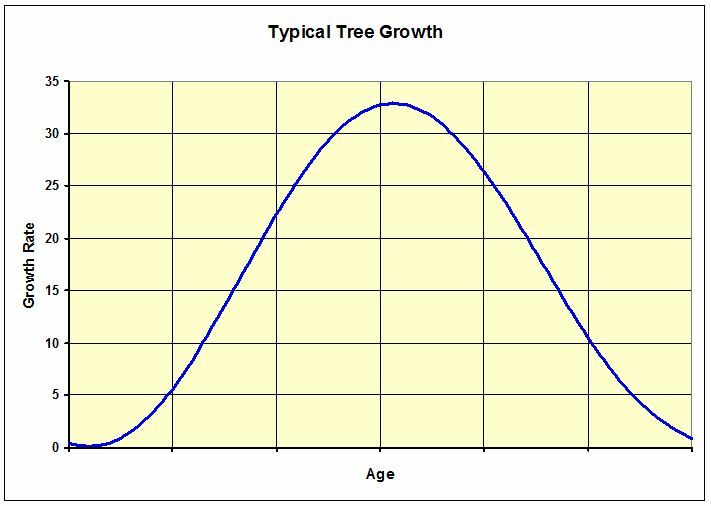 The cumulative mass and volume of a tree over time forms an s-curve, with maximum growth occurring in middle period of growth. At maturity, growth and uptake of atmospheric carbon is marginal. If carbon sequestration is prioritised, trees should be harvested at the end of peak growth and the wood material used to produce buildings or furniture, thus storing the carbon. 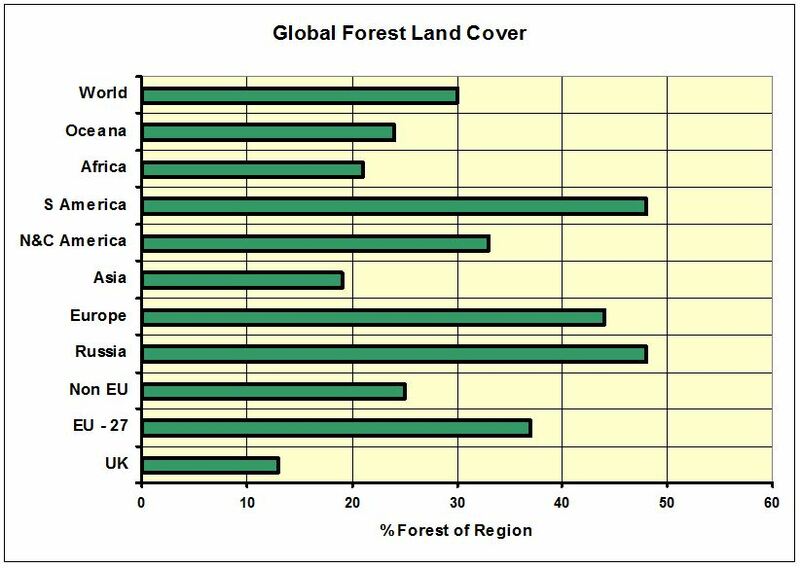 Global forests cover about 26% (39 million km2) of the land area, but 130,000 km2 are destroyed annually. They contain 638 Giga tonnes of carbon, which is more than is held in the entire atmosphere. They sequester 2.4 Giga tonnes annually [3.0]. Forests and woodlands in the UK contain around 90 Mega tonnes of carbon, roughly equivalent to the total annual UK emissions. 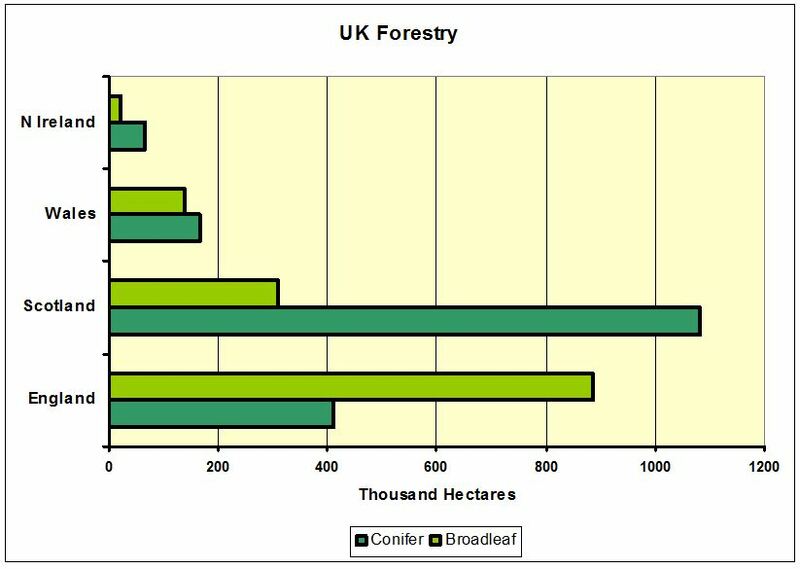 30 Mega tonnes of carbon are stored in conifers, 60 Mega tonnes in broadleaves and mixed woodland. There has been a recent decline in UK afforestation. This has implications for the UK forest carbon sink. Whilst there were increases in sequestration rates from 1990 to 2004, as carbon accumulated in growing trees planted during the period of rapid forest expansion post war (1945 onwards), it is likely to decline due to reduced planting rates in the last 20 years and harvesting of mature trees. This apparent decline reflects the rules for carbon defined by the Kyoto protocol which excludes second generation forests from the carbon sink, which diminished the incentive [3.1]. Approximately 4 Mega tonnes of carbon are removed from the atmosphere each year by trees in the UK. It is estimated that trees covered one half of the land area of Scotland at the end of the last ice age, 10,000 years ago, when human colonization began. Forest coverage peaked at 80% by about 5,000 years ago, but dropped to only 4% by the 18th century. This was due to prolonged overuse for dwelling and boat construction, as well as for fuel, without any significant management or replanting [4.0]. Carbon storage in Scottish and UK forests has been declining as a result of new-planting rates falling and younger forests, which sequester more carbon than older forests, maturing. Scotland’s forests currently capture around 15% of Scotland’s CO2 emissions [4.1]. During the 1970s and 1980s there was a period of major forest expansion, which then declined in the 1990s and 2000s. As the average age of Scotland’s forests has increased, the quantity of carbon dioxide that they are able to remove from the atmosphere has reduced. In order that climate change targets are achieved, action is needed to reverse this trend. As a result of improvements to the Scotland Rural Development Programme [4.2] and activity on the national forest estate, new woodland creation nearly doubled between 2009-10 and 2010-11, from 2,700 hectares to 5,100 hectares. A further significant increase was achieved in 2011-12 with a rise to 9,000 hectares. 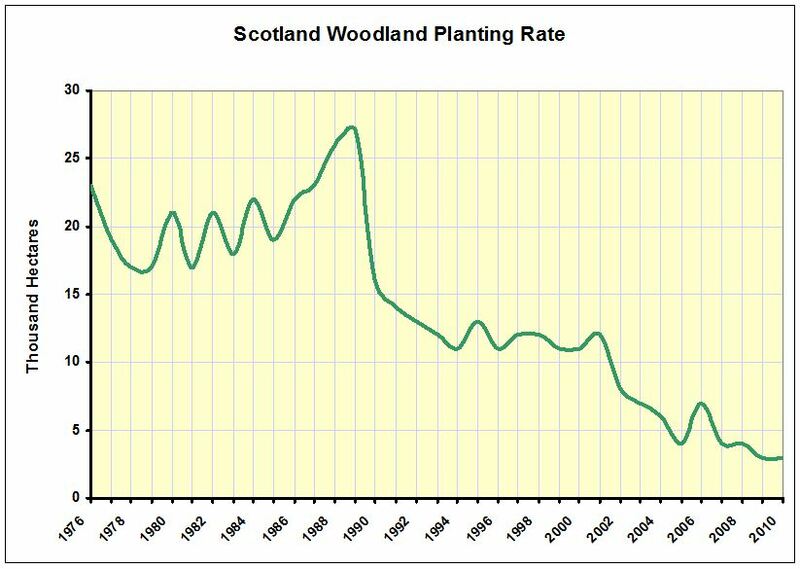 Acting as a carbon sink, Scottish forests sequestered 8.3 mega tonnes CO2 in 1990, increasing to 10 Mega tonnes CO2 by 2009. However, since 2004, the forestry sink has seen a slight decrease due to a drop off in historic planting rates. The Scottish Forestry Strategy [5.0], introduced in 2006, recognises the importance of trees and forestry as a sustainable source of building materials and fuel, a natural environment for wildlife, a recreational space in addition to a method of storing atmospheric carbon and mitigation of fossil fuel CO2 emissions. 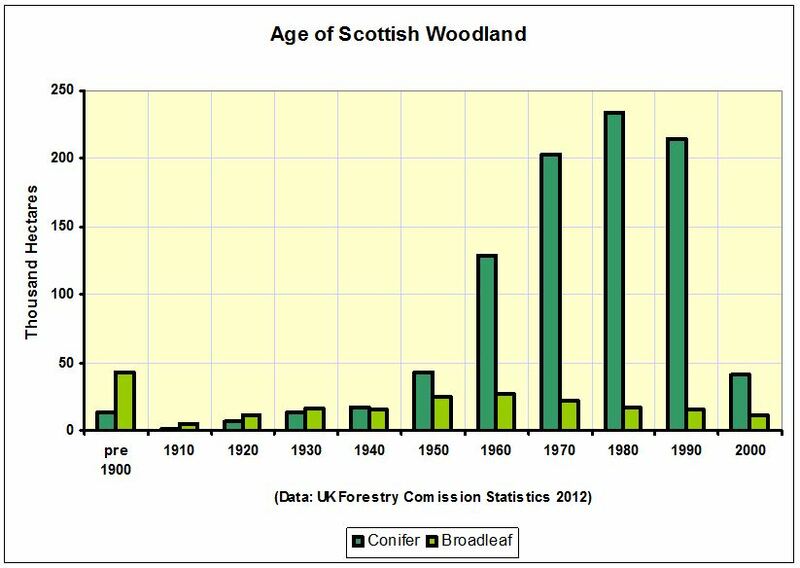 Recognising that in the BAU (Business As Usual) scenario, sequestration by forestry would decline by around 4 Mega tonnes CO2e between 2009 and 2022 – a legacy of historical woodland creation rates, which declined in the 1990s after high levels of planting in the 1970s and 1980s – the Scottish government developed the strategy to encourage afforestation and improved woodland management. The strategy has two target levels for afforestation. The minimum target to achieve 25% of land coverage by 2050 is set in policy, and the stretch target of 29% coverage is by proposal. Since carbon sequestration by forestry is a function of planted area, yield class and tree age, predicting future rates is complex. However, by increasing forest area and with management geared towards harvesting mature trees and replanting at sustained levels, absorption and storage of atmospheric carbon can be maximised. This aim was reaffirmed in the Scottish Government’s Rationale for Woodland Expansion [5.2] in 2009, which set a target of planting a further 650,000 hectares of woodland. This requires woodland planting rates to increase to an average of 10,000 ha/yr. Scottish Ministers have pledged to plant 100 million trees by 2015 as part of The Climate Group States and Regions Alliance’s [5.3] commitment to plant 1 billion trees to encourage governments, businesses and communities worldwide to plant a tree for each person on the planet. Proposals: Reducing emissions from Rural Land Use by increasing woodland creation to 15,000 hectares per year. Expected abatement: (310 +) 144 Kilo tonnes CO2e in 2020. Trees act as a carbon store, helping to remove CO2 from the atmosphere. Deforestation releases stored carbon back to the atmosphere. The IPCC sees afforestation as a significant mitigation strategy against Global Warming. 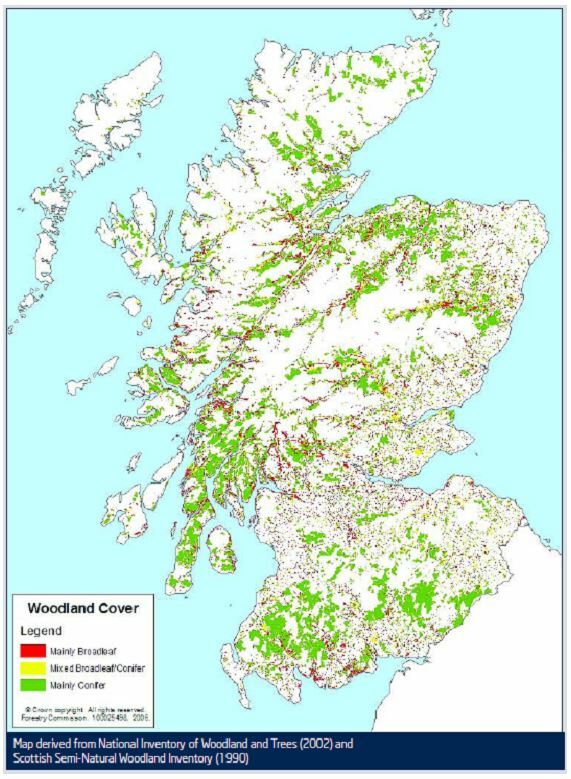 Scotland has much less forested area than before and can support expansion. Properly managed forests combined with wood manufacture and construction can increase the carbon sink.